They are epic, drawing the best & brightest permaculturists from around the world to help put together visionary solutions for a better world. For more than 40 years, Permaculture has been leading the way with innovative, planet- and climate-friendly design strategies, that are just now being fully recognized by the rest of the world as the answer to some of our most pressing problems. IPCs take place every two years in different parts of the globe, switching between continents. Past host sites have been in Australia, USA, New Zealand, Scandinavia, Nepal, Croatia, Brazil, Malawi, Jordan, Cuba, and the United Kingdom. the next IPC takes place in Hyderabad India, November 2017, hosted by Aranya Agricultural Alternatives. Learn more below. 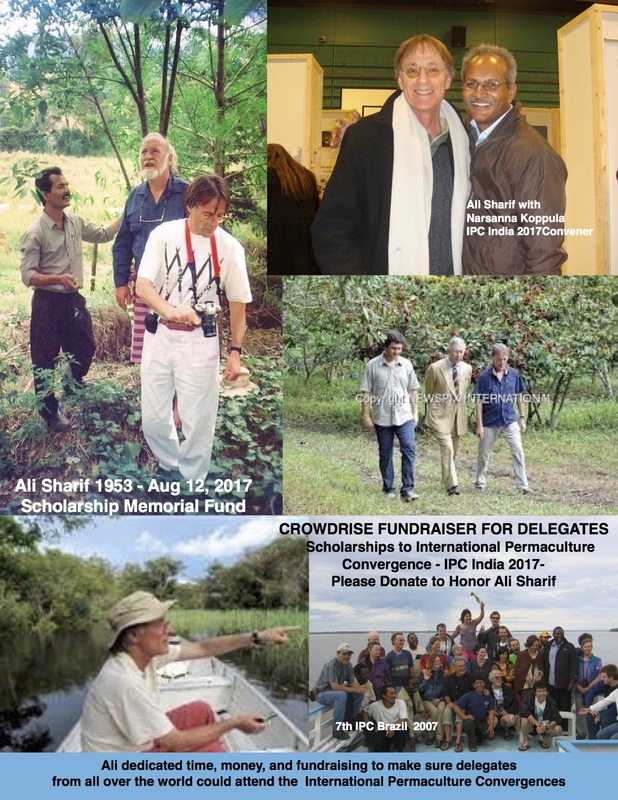 Please join us for a special 15 day fundraiser in honor of Ali Sharif, one of the original Permaculture "missionaries" who took permaculture out to the world in its earliest days, and convened an IPC in Brazil in 2007. 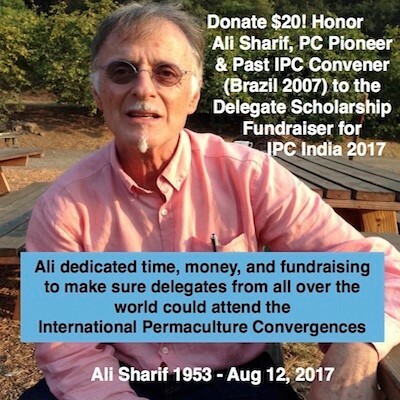 The Friends of the International Permaculture Convergences (FIPC) would like to establish a special Ali Sharif Scholarship Memorial Fund to honor all his years of fundraising efforts for delegates, and continue with his vision of helping both the delegates and the IPC conveners, now and into the future. Won't you help get things started with just $20? If 1000 people sent in just $20, we would have $20,000 to cover most of the costs of scholarships for delegates waiting to hear if they can come to IPC India in November 2017. Larger donations also welcome & appreciated! We first met Ali Sharif in Croatia in 2005 where we attended our first International Permaculture Convergence (IPC). In those days, only the bravest stepped forward to take on the task of hosting these enormously complicated international events. After Croatia, Ali volunteered to host the next IPC in Brazil, where he had been working for more than 20 years, establishing Permaculture centers in all the regions and ecosystems of Brazil, from the favelas in huge cities, to remote jungle centers on the Amazon. He was up to the job. In addition to organizing the Convergence, Ali dedicated time, money, and fundraising to make sure delegates from all over the world could attend IPC Brazil, never constrained by the limitations of money. And of course, these delegates, who had so much knowledge & skill to share, often had never traveled outside their own countries, and needed assistance with visas and passports, and the logistics of travel, which Ali provided. Ali Sharif missed the last IPC in 2015 in the UK, but he was happy to hear India would be the next IPC host. He expressed his strong desire to attend, and, once again, help find funding for delegates get there, when he became ill. Ali died recently in South Africa, while awaiting a heart transplant. Ali Sharif visited Santa Barbara, California in 2016, and we recorded an informal but very special interview with him (see below). Please listen to this remarkable story of a Permaculture "missionary", who along with other permaculture pioneers, made permaculture the global movement it is today. 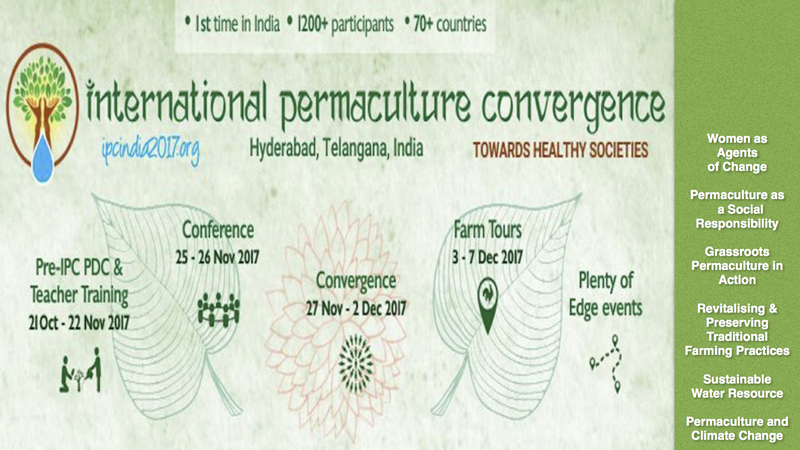 The Friends of the International Permaculture Convergences (FIPC) is a USA-based, fiscally sponsored nonprofit of Inquiring Systems Inc; whose specific mission is to provide scholarships for delegates from around the world attend the International Permaculture Convergences. All donations are tax deductible.